Admittedly, we have yet to drive a vehicle – namely the 2018 NSX supercar or RLX Sport Hybrid – with Acura’s latest Sport Hybrid Super Handling-All Wheel Drive system. Although we can imagine well enough what it’s capable of in something like the NSX and RLX, we do wonder how it might change up the ride and handling of an SUV like the MDX? The 2018 Mdx Sport Hybrid is equipped with the patented all-wheel drive, three-motor system from Acura. 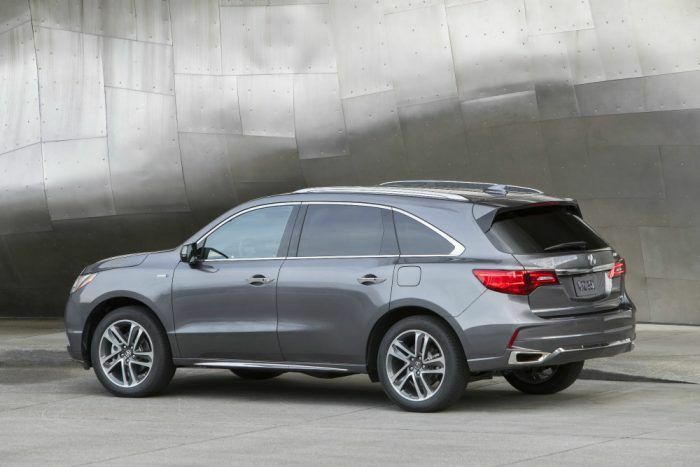 The MDX Sport Hybrid’s performance features are plentiful and exciting. For example, the 3.0-liter i-VTEC V6 engine creates 321 horsepower and 289 lb-ft. of torque, meaning it’s the most powerful SUV Acura has ever manufactured. Acura says despite turning out 30 additional horsepower and a 45 percent higher EPA city fuel economy rating when compared to the conventionally-powered MDX, the Sport Hybrid is only an extra $1,500. In our minds, the hybrid variant is easily worth the extra money. That’s the way we would go. Other performance features include a seven-speed dual-clutch transmission, an Integrated Dynamics System with a SPORT+ mode, Active Dampers, and Electric Servo Brakes. The 2018 Acura Mdx Sport Hybrid comes in two new shades of red but this lighter gray/silver isn’t half bad either. Photo: Honda North America. Acura’s designers must love red as two new colors, Basque Red Pearl II and San Marino Red, are now available. The Technology Package and Advance Package are on offer and include unique interior trim elements and stainless steel sport pedals. It’s worth noting the Technology Package can seat seven, while the Advance Package seats six with second-row captain’s chairs and a larger center console in place of a three-person bench seat. Adaptive Cruise Control with Low Speed Follow, Forward Collision Warning, Lane Keeping Assist, and Collision Mitigation Braking are among the available safety systems. The 2018 Acura MDX Sport Hybrid is available now with a starting MSRP of $52,100. If you drive one off the lot, let us know on Twitter how you like the Super Handling-All Wheel Drive system.